An incomplete cast copper alloy saucer brooch of early Anglo-Saxon date (c. AD 450-600). The brooch has an incomplete outwardly-turned rim around a central panel of decoration. The cast decoration is partly obscured by concretion but depicts a central circular motif with an equal-armed cross, and is surrounded by a repeating interlace design possibly of an entwined beast. Gilding survives over much of the outer face. The reverse of the brooch retains both the catch plate and single lug for the pin. 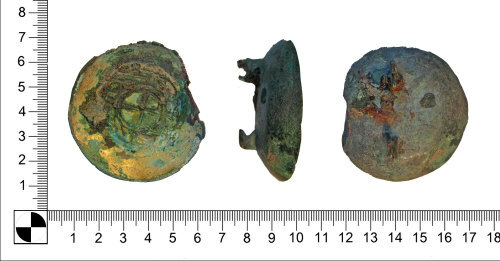 This brooch was found along with another of identical design, and this may suggest the presence of a grave. The other brooch has been recorded on this database as OXON-65D2A2.